Galactic Jack is the right fuel to propel your mind up to unknown altitudes. The name of the strain is a cool play on words - she was created by crossing Jack Herer with Space Queen. She is a tall plant with a high Sativa dominance and extreme potency. Galactic Jack boasts with a THC level of 25% and a very uplifting and energetic high. Ready for harvesting after 10 weeks. 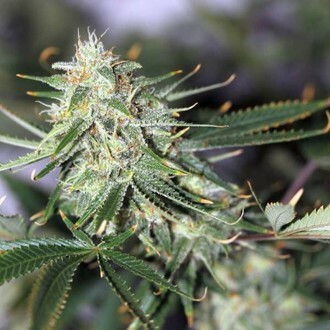 The name of Galactic Jack is a great tribute to Jack Herer and a cool play on words - she was created by crossing the legendary Jack Herer with Space Queen and she really lives up to her name. The end product of this variety is the right propellant to thrust your mind up to unknown spheres of your consciousness. Galactic Jack is recommended for indoor cultivation only and performs best in a ScrOG set-up. Unless the height is no problem, you should take measures to control it because she tends to grow very tall when left to grow on her own. As a rule of thumb, expect her to double in height from the beginning to the end of the flowering time, thus it is advised to plan ahead. It is recommended to trim her properly to maintain an even canopy. Owed to the 80% Sativa share in the genetics, Galactic Jack requires 9-10 weeks to develop its large, rocket-shaped buds, but the relatively long wait is rewarded with extra strong resin production. At the end of the flowering period the buds look as if they had been rolled in sugar. The aroma of citrus, grapefruit, sweet lemonade and musk will caress your olfactory sense and the lemon aftertaste on the exhale will make you drool. Galactic Jack achieves only average yields, but the potency of the end product is simply through the roof. Galactic Jack boasts with a THC level of 25% and a very uplifting, energetic and long lasting cerebral high, but without confusing the user.